The robing room was alight with gossip this morning when I went off to court. There’s a vicious rumour going around about one of the district judges in the south of England. I can’t be more specific as to where she’s based as it’d be pretty easy to identify her but for present purposes I shall call her JudgeJewellery. 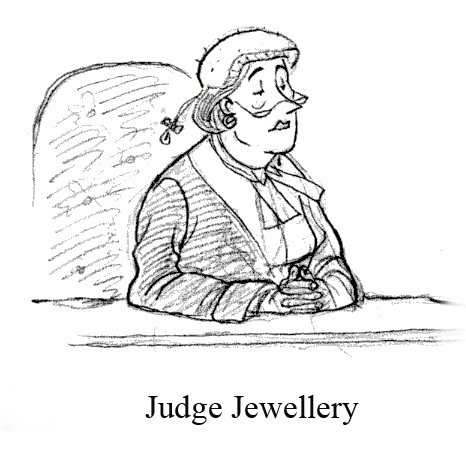 Anyway, the rumour goes along the lines of someone knows someone who knows someone and then at the very end of the line, who knows someone who knows JudgeJewellery herself. This particular person is a barrister and was indiscreet enough to tell her room-mate in chambers who has shared it with a few other and so it went on. Apparently the gossip has been out for weeks but I only heard it today as I was in front of the sparkly judge herself. Why the name you ask? Well, apparently she unwisely confided to her garrulous friend that she has a penchant for cheap jewellery from a high street chain which I will call CheapnNasty. Nothing particularly unusual there you might say. Except that her penchant goes one step beyond merely the jewellery itself. Apparently she gets a thrill out of stealing it straight out the shop. All £10 worth at a time. Whipped off the shelf, into her Gucci handbag and then straight out the shop without anyone daring to accuse someone so glamorous of stooping as low as to steal something so cheap. And if that isn’t enough, she then likes to show off her wares in court the next day like some sort of trophy. Sounds completely unreal but although the chain of Chinese whispers was fairly protracted, the gossip did come from reliable sources. Certainly she was sporting some gaudy looking earrings today which certainly didn’t seem to go with the rest of her outfit. Not that I’m much of a judge of these things but even so, they looked fairly out of place. However, the great thing about JudgeJewellery and I’ve been in front of her more than once before is that simply out, she carried off whatever she is doing with enormous style. It’s not merely that she is beautiful. Without wanting to make it all sound crass, she’s one of those few people within the law who effortlessly seems to rise above it. To be in a class of her own. I’ve seen her reduce a barrister to rubble merely with one of her slightly amused smiles. If there really is an ‘it’ of a secret formula out there, then JudgeJewellery surely has it. Which means that because it’s her, she can even make nicking cheap jewellery seem kind of cool. Which of course it isn’t. But hey. I don’t think I’m the only male member of the bar who is suffering from this mild infatuation. A mild infatuation – seems pretty marked if you are already forgiving theft!